Home / Best Double Din Bluetooth • Jensen • Reviews / Jensen VX7021 Review: Is It Compatible With My Vehicle? What is the Jensen VX7021? Is it Compatible With My Vehicle? What makes the Jensen VX7021 unique? If you’re thinking about replacing your car’s stock stereo system, or if you are looking to upgrade an existing aftermarket system with a new head unit, you might not know where to start. You know your needs, but finding a head unit to match can be tricky. Jensen’s VX7021 is a reasonably priced, middle-level model that is definitely worth looking into. This Jensen VX7021 review will break down some of the key features and capabilities to help you make a decision on purchasing this unit. 1 What is the Jensen VX7021? Is it Compatible With My Vehicle? 2 What makes the Jensen VX7021 unique? The Jensen VX7021 is an in-dash navigation unit – but in reality it is much more than that. The aftermarket head unit transforms your dash into a multi-media entertainment and navigation system. The Jensen VX7021 is what is known as a double DIN stereo unit. If you’re unfamiliar, “DIN” simply refers to the size of the stereo head unit. Single DIN and double DIN are the two most common sizes of stereo head units. 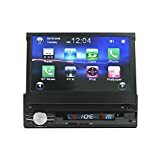 This particular head unit will only fit in your car if you currently have a double DIN stereo opening as a single DIN would be too small. To find out, all you need to do is measure. In fact, you’ll probably be able to tell without measuring. A double DIN stereo unit will be about four inches tall, twice as big as a single DIN stereo system would be. Google searching images of single DIN vs. double DIN should be a big help too. The Jensen VX7021 can bring a whole new realm of functionality to your car stereo system. The unit has in-dash navigation, smartphone integration, hands-free capabilities, and a large touchscreen. The Jensen VX7021 is unique in many regards, so in this Jensen VX7021 review, let’s break down some of the key features. One of the most alluring features of the Jensen VX7021 is its hands-free capabilities. The unit is equipped with Bluetooth technology allowing most modern phones to be connected wirelessly. Bluetooth allows for hands-free phone calls and music streaming. Bluetooth music streaming capabilities allow you to play music, audiobooks, or other audio directly from your phone through your car stereo without a wired connection. One verified purchaser of this unit noted the quality of music streaming over Bluetooth. “My wife loaded my favorite AC/DC albums from Spotify onto her iPhone and they played seamlessly via Bluetooth. The sound was very clear and crisp,” he said. Bluetooth capability can be especially beneficial in regards to hands-free calling. We all know that driving and using your phone is dangerous. The Jensen VX7021 allows you to make calls, take calls, and access call history in-dash without ever taking your hands off of the wheel. Another feature offered on the Jensen VX7021 is the included GPS capabilities. Jensen has partnered with iGo Navigation to provide on-screen navigation. The system comes pre-loaded with maps of the entire U.S., Puerto Rico, and the U.S. Virgin Islands, though options are available to purchase additional international maps. Navigation capabilities help you find gas stations, restaurants, cross-streets and more without ever having to pick up a phone or even worse, an old-school map. The VX7021 has 10 million points of interest from TomTom preloaded in its preinstalled 4GB memory card. The VX7021 provides audible, turn-by-turn navigation as well as lane guidance and on-screen depictions of complicated intersections – built right into the system. Additionally, the navigation system uses 3D representations of landmarks and buildings to make it easier to get where you are going. It is important to note that the VX7022 does have any text-to-speech technology. This means the GPS navigation system will read street names aloud, something that is not standard on most units in this price range. Another factor to consider, is that maps on the unit do not update automatically but will need to be periodically manually updated, at your expense. The GPS functions require the use of two antennas. The VX7021 has one GPS satellite antenna built in and comes with an included external antenna which can be mounted either inside or outside of the vehicle. The unit will carry out standard stereo and video player functions as well. DVDs and CDs can both be played from the built-in disc drive immediately after installing the unit. The AM/FM tuner will not disappoint for the days when you forget your phone or iPod and want news or music radio to listen to. Also, the unit has a 3.5mm auxiliary input so you can stream audio from virtually any device whether it has Bluetooth or not. One way the Jensen VX7021 is lacking is in the absence of Apple CarPlay and Android Auto. Many higher-end modern stereo systems have this functionality, and if it proves to be a function you deem essential you’ll want to look into some of those. CarPlay and Android Auto allow for a reduced-functionality operating system replication from your mobile phone. If you have a compatible Android phone or iPhone, Apple CarPlay and Android Auto allows you to see a copy of what you’d see on your phone screen, specially formatted for the head unit display screen. CarPlay and Android Auto allow you to access many of your phone apps seamlessly. If you use Pandora, however, you’re in luck. The unit does have an integrated feature allowing control for the popular music streaming app for iPhones, iPads and iPods as well as most Android based devices. 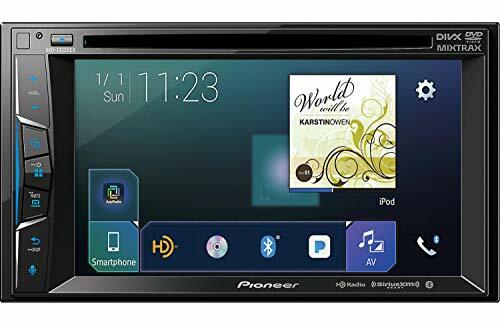 If you are looking to potentially integrate the Jensen VX7021 into a larger car stereo system, you’ll want to know a couple of the specifications regarding expandability. The Jensen VX7021 is compatible with Sirius XM satellite radio tuners. These are external radio tuner units that connect directly to the head unit to allow for satellite radio reception. The VX7021 is ready for plug-and-play listening with a Sirius XM tuner which can be purchased for as low as $38. The unit has a built-in 13-watt amplifier and several preamp outputs. The VX7021 has a 6-volt front, rear, and mono subwoofer output. Additionally, the unit has a video output in the rear for connecting additional displays. For inputs, the unit provides several different hard-wired options. A standard front USB input and front minijack input are coupled with rear RCA A/V inputs and a separate rear video input for the addition of a backup camera. For a unit in this price range, this is very impressive in terms of expandability. A little thought of expandability feature that you’ll want to keep in mind is how a head unit interacts with existing or aftermarket steering wheel controls. You have probably seen a steering wheel with built in buttons for skipping channels or songs and adjusting volume. They look a little bit like more traditional cruise control buttons. The Jensen VX7021 is compatible with most steering wheel audio control but requires an additional adapter called a PAC adapter. For further hands-free control, the unit comes with a remote control. While you shouldn’t use it as the driver, passengers can change the channel, song, or adjust the volume from the passenger or back seat. If radio quality is of a big concern to you, you may be disappointed to learn that this unit does not have HD radio capabilities. HD radio is a mirrored stream of traditional radio stations available to specific tuners that can play higher quality broadcast audio. Most people do not use traditional AM/FM radio as their primary source of entertainment, however, so this may not be a problem for you. The VX7021 is fairly standard as far as customization goes. Key color is adjustable across the RGB spectrum. Users also have their choice of ten wallpapers for the user interface background. The brightness has three different settings called Night, Dark, Normal, and Bright. When starting the unit up, onboard memory saves previous input setting information. That means, if you were listening to your iPod when you last put your vehicle in park, the next time you start it up it will return to playing your iPod input. The unit takes about 18 seconds to power up and become usable and an additional five seconds to be able to access the navigation options. The unit has a unique setting allowing users to set a standard “start volume” that the unit will tune to every time it is powered on. This can avoid the startle that you sometimes experience when you left your stereo on very loud and powered your vehicle on without remembering. The device is primarily controlled by the large, 6.5-inch touchscreen but there are some standard hard controls like seek and skip buttons and a rotary volume dial. 6.5 inches is about average for double DIN stereo units. Some higher end units employ a full 7-inch screen but most in this price range are about 6.2 inches. It is also important to note that the touchscreen is a resistive touchscreen, not a capacitive touchscreen. Capacitive touchscreens are common in modern smartphones and tablets and are the more advanced of the popular touchscreens today. The Jensen VX7021 is the middle of the road for multimedia capable double DIN stereo units. There are some more affordable units, sure, but you need to determine what features are essential to your car stereo and make your decision based off of that. The Jensen VX7021 offers many features that it’s more affordably-priced counterparts do not. Additionally, the VX7021 is lacking in some areas that higher end units would not be. The Jensen VX7021 reviews are generally positive and the included features are laid out very clearly. Because of its relative affordability, the Jensen VX7021 garners a need for review. Car audio experts across the internet have provided their opinion on the unit. Top Ten Reviews, an online consumer reporting website, noted that the unit performs exceptionally well as far as navigation and audio streaming goes, but had some notes regarding price and smartphone integration. One verified buyer on Amazon was very pleased with their purchase and offered some remarks. Let’s compare the Jensen VX7021 and the very similar Kenwood DDX24BT. The Kenwood DDX24BT is an in-dash navigation and entertainment unit for use in double DIN car stereo openings. The DDX24BT retails for around $$$, considerably cheaper than the VX7021. The Kenwood and Jensen unit have about the same features short of smartphone integration and navigation aspects. The Jensen unit has a more advanced navigation system with text-to-speech technology and 3D rendering capabilities. However, the Kenwood model has better integration with smartphones and external devices. This Jensen VX7021 review should prove, that to some degree, the unit is impressive for its price range. While other models may include additional features, the overall functionality of this unit is impressive. If you are looking for a primarily entertainment-based car stereo system you may be happier with another unit. 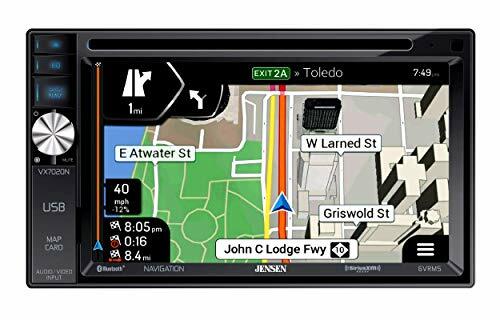 But, if you want a unit with reputably-backed GPS information, that has industry standard audio specifications, you should consider the Jensen VX7021. As with any purchase, purchasing a new stereo head unit comes with a bit of consumer responsibility. Hopefully, this Jensen VX7021 has given you a clearer understanding of the features and whether or not they meet your specific needs. Jensen’s VX7021 is a reasonably priced, middle-level model that is definitely worth looking into.The unit has in-dash navigation, smartphone integration, hands-free capabilities, and a large touchscreen.The unit is equipped with Bluetooth technology allowing most modern phones to be connected wirelessly. Bluetooth allows for hands-free phone calls and music streaming. purchasing a new stereo head unit comes with a bit of consumer responsibility. Hopefully, this Jensen VX7021 has given you a clearer understanding of the features and whether or not they meet your specific needs.